In conjunction with the Biology of Butterflies conference, we are organizing a butterfly-themed philately and art exhibition that will be open to public, and free. This exhibition will be held in Raspuri Hall in NCBS, 10am-6pm on 11-14 June. 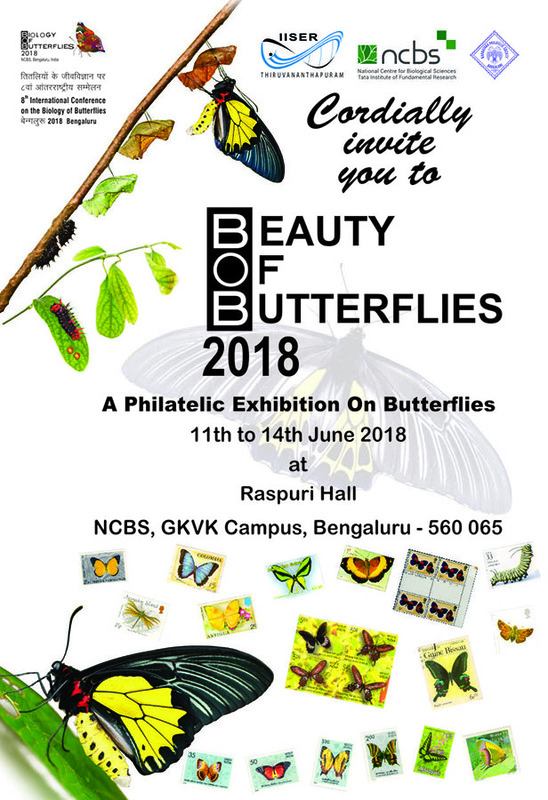 Philatelists from across southern India will put up their displays of butterfly stamps at this exhibition. On 11 June there will be a My Post counter from India Post, where people can get custom-made butterfly and other stamps. We are releasing a special postal cover for the BOB conference, which will also be available in post offices and NCBS after 11 June, in addition to being available at this exhibition. A team of designers and painters from the Srishti School of Art, Design and Technology and NCBS will display their butterfly and moth posters. Paresh Churi, an artist and naturalist from Mumbai, will display his beautiful butterfly frames. This exhibition is a joint outreach programme conducted by NCBS, IISER-TVM, Karnataka Philatelic Society, Srishti School of Art, Design and Technology and Titli Trust. Email the organisers if you have any questions. Mark your calendar and visit NCBS to see the exhibition, enjoy a conversation with butterfly biologists and learn about all the exciting research that is happening in NCBS, IISER-TVM and beyond, and grab the opportunity to acquire some cool, custom-made butterfly stamps along with a special postal cover and post-cards on butterflies.